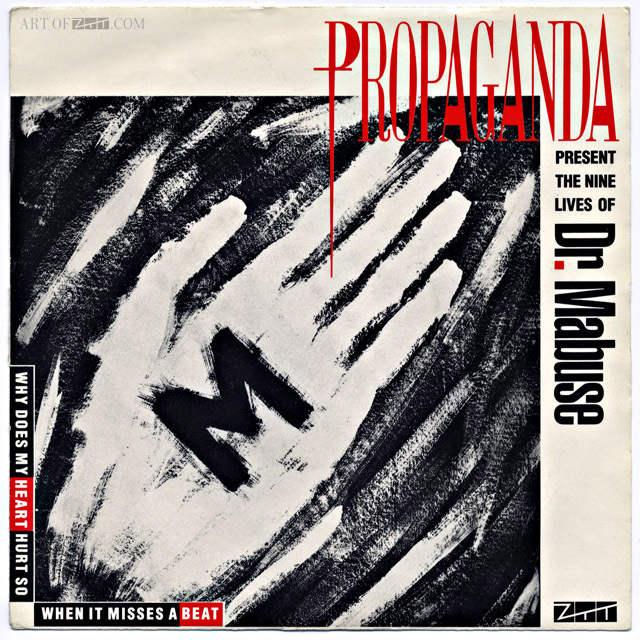 artist: Propaganda title: Dr Mabuse format: 7″ single design: XLZTT photography: Anton Corbijn illustration: Anton Corbijn cat. 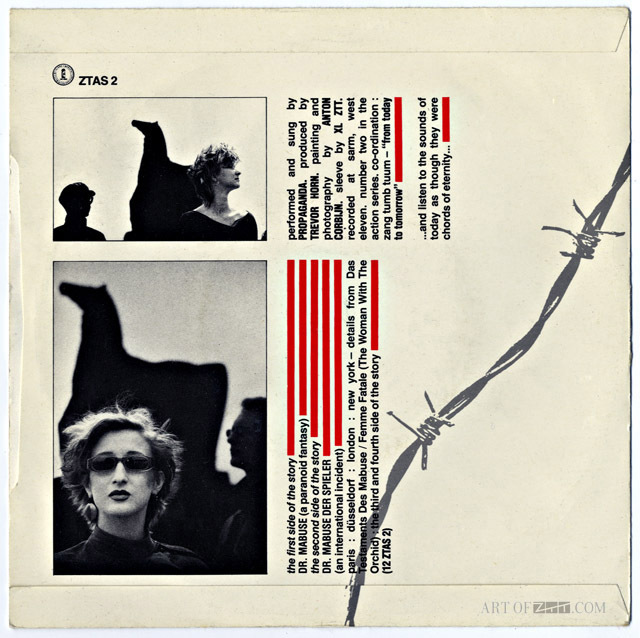 no: ZTAS 2 date: 27/02/84 art of notes: This ‘hand’ sleeve was the first of two different designs for both the 7″ and 12″(the other is known as the ‘zeppelin’ sleeve). 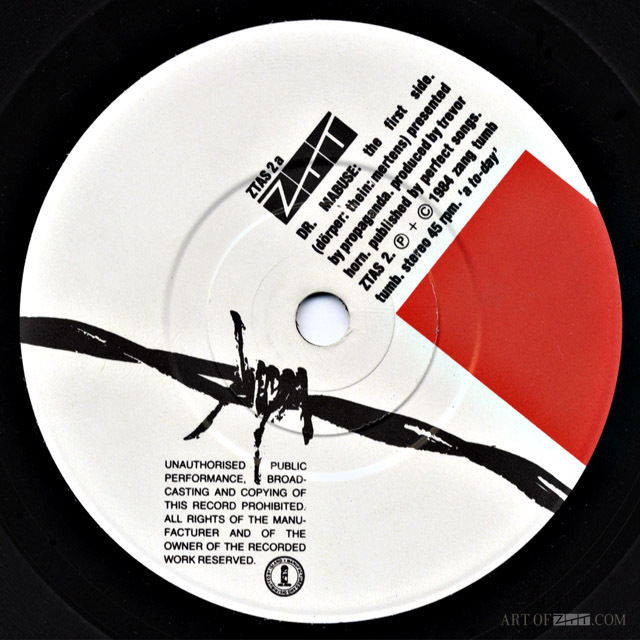 Some copies included instrumental versions of the A side but these were random, never highlighted on the sleeves and could appear inside either designs. Thanks for this fascinating info — I’d always assumed these were all like the ones I own: vocal version in hand sleeve, instrumental in Zeppelin sleeve. Do you know if the randomness was intentional? I suppose it would be very ZTT to make a mistake and then not correct it but embrace it. I’ve no idea, it does seem odd that they printed two completely different sleeves for both 7″ and 12″ and didn’t highlight different mixes. But then again they did that for Relax too with no mention except the occasional sticker on some editions. It’s possible that the white ‘hand’ sleeve was for the vocal and the black ‘zeppelin’ sleeve for the instrumental versions and that things got mixed up because they didn’t change the labels at all. Remember, this was only the label’s third release and came out in the midst of Frankie being no.1 so it was early days and things were probably a little random. By Two Tribes they had it locked down a little more and probably some cash coming in from the sales of Relax so they could do more with sleeves, labels, posters etc. I expect Morley reveled in the chaos either way.